Join Sherwin-Williams at this new shopping center located along Central Drive in Bedford, Texas adjacent to Walmart Neighborhood Market. This newly constructed shopping center provides great visibility to strong traffic counts along Central Drive. Surrounding retailers include, Panda Express, Wells Fargo, QuikTrip and Walgreens. Unique 3,600 SF office located at the corner of Lovers Ln and Inwood Rd in Dallas. This office comes equipped with a beautiful full kitchen, 9 offices, a conference room and 2 restrooms. Just ¼ mile west of DNT and surrounded by tons of retail and restaurants, this office provides easy access to all of DFW and no shortage of dining options. 25,154 SF building for lease along heavily trafficked 1st Street in Garland, Texas. This shopping center benefits from easy access, great visibility and a large pylon sign in one of Garland’s most population dense areas. Soon to be renovated Kroger shadow anchor shopping center located at Story Rd. & Irving Blvd. in Irving, Texas. Adjacent to a very busy Kroger grocery store, this property offers tenants strong traffic throughout the day in the densely populated Irving market. New 11,000 SF shopping center located at the NEQ of Cockrell Hill and Highway 67 in Duncanville, Texas in front of WinCo Grocery Store. This shopping centers high façade will provide great signage and visibility to HWY 67 and 100,000 VPD. The property also benefits from WinCo’s 28,000 customer trips per week. 19,233 square foot shopping center anchored by On The Border located at the SEC Northwest Highway and Saturn in Garland. 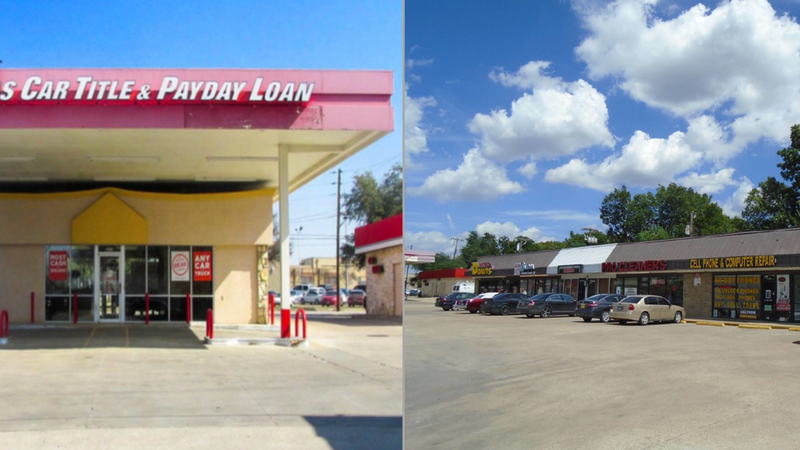 Soon to be redeveloped, this shopping center has great visibility and easy access on Northwest Highway. Surrounded tenants include Walmart, Tom Thumb, Pet Supplies Plus, Raisin Canes and more. 2nd Generation Restaurant at the hard corner of Jefferson Blvd & Zang Blvd. Excellent signage and visibility from both Jefferson & Zang. Half Mile South of Bishop Arts District. Ample amount of street parking in front of building. 29,645 SF shopping center located at the southeast corner of Garland Road and Easton Road in rapidly changing east Dallas. This shopping center boasts strong traffic counts and unmatched visibility along Garland Road with close proximity to White Rock Lake, Dallas Arboretum, Casa Linda, Lake Highlands and Lakewood. Exciting new retail/restaurant space facing the new 3-acre Pacific Plaza Park in Downtown Dallas. Located below 149 new Class A apartments and the newly opened Cambria Hotel. Pacific Plaza Park is set to be completed in 2019 and will offer a beautiful outdoor park for the surrounding offices and residential. 1900 Pacific Retail will provide unmatched visibility and exposure to the park and its visitors. 5101 South SH 121 is a well positioned shopping center in The Colony, Texas with great exposure to SH 121. The shopping center is located in front of Top Golf and across the highway from the 433 Acre Nebraska Furniture Mart development and its approximately 10 million annual visitors. Join Shipley Do-Nuts in this future retail strip coming June 2018 in fast growing north Fort Worth. Located at the SWC of Beach Street and N Tarrant Pkwy, this property is adjacent to Fossil Ridge High School and its 2,400 students. Surrounded by high residential density and incomes, this shopping would be a great fit for restaurant or medical users. Independence Square is a strong grocery anchored shopping center at the SEC corner of Parker and Independence Parkway in Plano, Texas. Area incomes are over $112,500 and traffic counts are close to 70,000 vehicles per day. Located near the southeast corner of Ferguson Road and Lakeland Road, this site is adjacent to a heavily-trafficked USPS Post Office in the Ferguson Glen Shopping Center. The property enjoys high visibility to a large amount of area traffic drivers and nearby redeveloping neighborhoods with disposable income. Retailers within close proximity, including Sam’s Club, Dollar General and CVS Pharmacy, attract a large consumer base making the property a prime retail location. White Rock Town Center is located in Dallas, Texas between Plano Rd and Jupiter Rd. 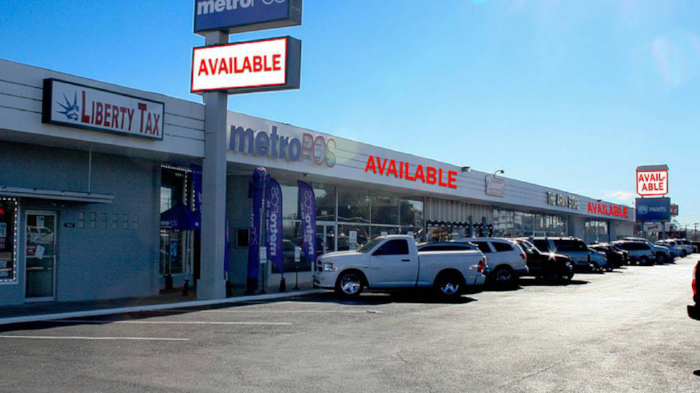 This retail strip center offers high visibility as well as easy access to LBJ Freeway (I-635). The property also provides easy entry and abundant parking in a high traffic area. Positioned on Garland Road, this building benefits from high traffic counts, great visibility, significant shopping traffic from nearby retailers and from nearby residential growth. Garland Road is a gateway to some of the most beautiful neighborhoods in Dallas including Lake Highlands, Forest Hills and Lakewood. Anchored by El Rio Grande Supermarket, Southtown Shopping Center is located in the heart of South Fort Worth and serves the densely populated Hispanic market. This shopping center offers great traffic throughout the day and benefits from easy access as well as great visibility from both I-35 & Berry St.
4716 Ross Avenue is a freestanding restaurant/retail building with easy access and plenty of parking. The property is located on the southeast corner of Ross Avenue and N Prairie Avenue, just minutes from Uptown and Downtown Dallas. The area is rapidly redeveloping and exposes this property to a high volume of traffic. 2928 Inwood Rd. is a freestanding office building on the corner of Inwood and Cedar Springs with excellent visibility and a traffic count of nearly 40,000 VPD. The property offers a large monument sign in the front and ample parking in the rear. The location is within minutes of the Dallas Love Field Airport, the Park Cities and the Medical District providing great exposure to a large group of consumers. 3022 Inwood Road and The Inwood Shopping Center at 3012 Inwood are two highly visible locations at the corner of Inwood Road and Cedar Springs Road. Both properties are easily accessible and have excellent exposure to a high traffic area. In addition to their excellent exposure, they are within close proximity to many popular retailers which include: Starbucks, Home Depot and Taco Bell. Located between N Peak Street and N Carroll Avenue on Gaston Avenue, this property is exposed to a high volume traffic area and is just a few minutes from Downtown and Uptown Dallas. Large retailers and redeveloping neighborhoods in the densely populated area provide a large consumer base with high disposable income.